OK, Back to business, I know, I know... I'm back from hiatus yet again. Once I started getting into disco tracks I somehow always leaned toward the heavy monster sounding ones. It was like my taste for funk didnt really change, only the years changed. So here's this amazing disco banger. Almost violent in its funkiness. It was a classic staple of mine for a long while. In fact, not long after discovering it, I found many sealed copies of it. Not a rare piece at all, on the Atco label. I dont think folks were ready for it then, cause the sealed copies stayed right in my stacks. Not sure if folks are ready even now. Perhaps all too common of a record? Well, until it's impossible to find all over again right? Where o' where are those copies though? 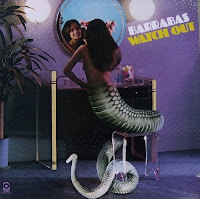 I think Barrabas were a funk rock outfit that branched out into disco and even some world influenced sound too. I believe they first penned "Woman" which is posted earlier in this blog by the amazing Junior Byron. "Oh no - Oh no"! Wow a track by barrabas.